What a glorious Summer we have had, we haven’t seen the likes of it in years. The plentiful sunshine meant one thing, people head outdoors more when the sun is shining therefore spending way more time in there back garden. Even though the sunshine is great to have around, our poor Irish lawns really did suffer the consequences. With no rain for weeks on end and a hose pipe ban in place this meant that our lawns resembled what we can only describe as the surface of the moon!! Our office phone has been hopping recently with every second call stating the same thing………………my lawn is burnt and dry and looks a mess. We ain’t complaining! This Summer we have transformed more lawns than ever before! The good weather has brought us in to our back gardens more than any Irish summer we have seen in recent years. 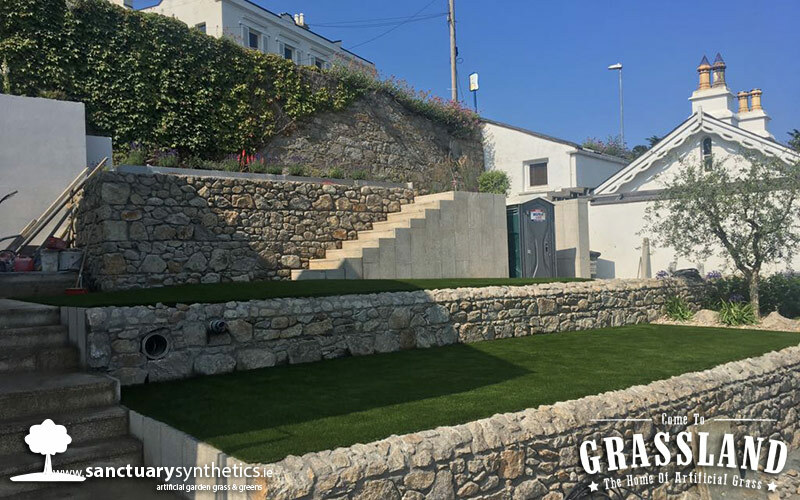 Now let’s talk about this stunning artificial lawn in Dalkey Co Dublin. I mean imagine waking up to this view every morning!! This house and garden are seriously goals. The artificial grass transformation has official put the finishing touch on this stunning sea view home. The garden area is split level meaning you can see that glorious view from every angle of the garden. 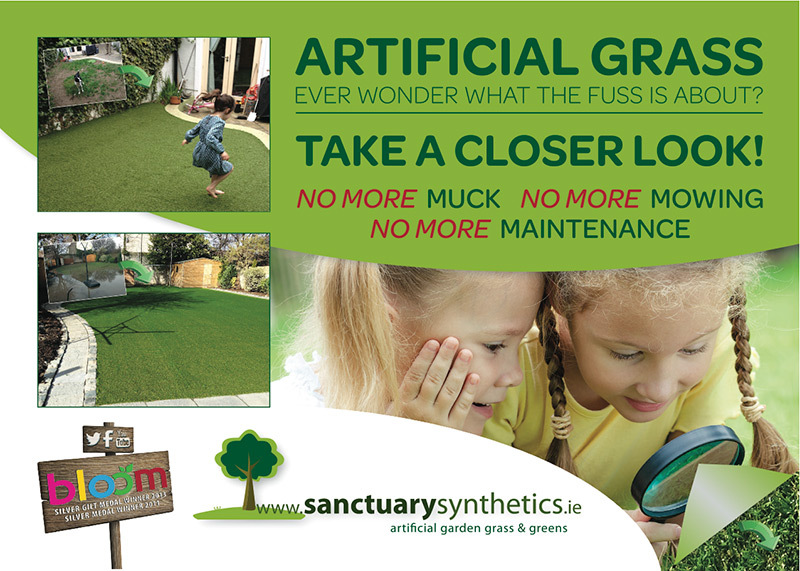 The artificial grass chosen for this job was our ever so popular REAL artificial grass. 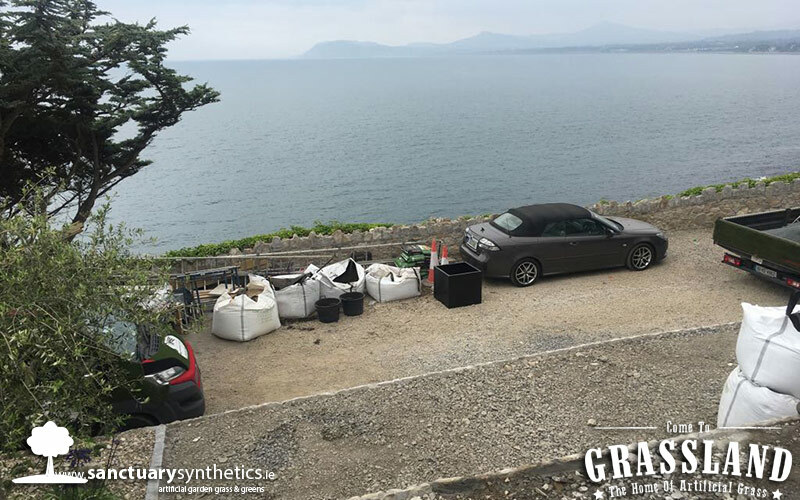 It fits the landscape of this property perfectly, better yet it can and does pass for a “real Irish lawn”. The customer wanted something that wasn’t too harsh in appearance as they wanted the garden to be as natural looking as possible. Artificial grass will keep this garden looking picture perfect all year round. The outside of this home really does leave an amazing lasting impression, one that will wow family and friends when they visit this costal property. 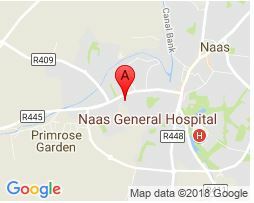 Our REAL artificial grass is 40mm in pile height and is by far our most popular artificial grass, it is the most realistic match to an Irish lawn in terms of colouring hence the name REAL. A medium to long length, 2 tone grass with Dark brown thatch and 2 colours of green fibres. It is a very hard wearing yet soft to touch grass. Making it the perfect choice for this lawn transformation.